One of the things my family likes to do is head out to the nature trails at the state park to go on little hikes or bike rides. Before our journey, we like to pack a picnic lunch to give us the fuel we need to endure some of those tough trails. A few years back, we somehow wondered from the short footpath trail onto the bike trail, and ended up on a 5 mile trek over rough and rugged terrain. It was brutal! Thankfully, we had full bellies before heading out, because we didn't have to hear the kids complain about starving to death in the woods. As soon as the rain lets up here, we are really looking forward to our first hike of the summer. And, of course, our traditional picnic before heading out. I like to pack light foods that aren't going to weigh the belly down. Chicken or turkey, fruits and veggies. That sort of thing. I've been trying to find new sandwich recipes to add to my picnic collection for these outings, and really liked the looks of this Greek Chicken Sandwich from Golden Blossom Honey. 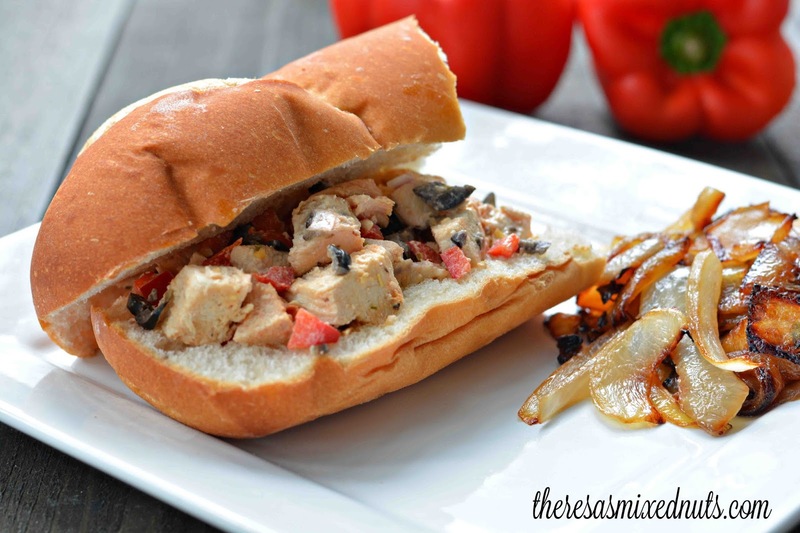 It's a great sandwich for your picnic or for a quick, late night dinner. I served ours with some caramelized onions, and it was oh, so yum! *Make sure you are peeling away all the extra bread from inside, otherwise you get too much bread and not enough filling. What are your favorite picnic sandwiches? I agree! Sounds like a great sandwich for a summer picnic! Loving this idea!! I recently made a delicious and simple sandwich as well, inspired by my uncle. We used some chicken scraps we had left over, mixed with lettuce, some onion and tomato, added mayo and mixed. Then made sandwiches out of that. Delish! Wow, that looks delicious! My son would be all over those caramelized onions! Then have your own picnic dahling! Don't you have a park close by you could take some scrumptious snacks to? I love anything Greek. Sandwiches are great in the summer time. Looks like an amazing recipe! The plates are nice too, but a Greek chicken sandwich sounds perfect to me! Grilled onions/scallions are my favorite thing on almost anything! The more the better. That looks so delicious! I love Greek inspired dishes. Honey is so yummy (haha). Great idea for a recipe! Oh yum! This looks like an amazing recipe. I will have to try it out when my family is in town next week. That looks so great. We are camping this weekend and I can totally see making this tomorrow night! That sounds yummy! I love Greek food & chicken especially! My husband would really love this recipe. He has always loved Greek cuisine and these flavors are right up his alley. Mmm hmmm that is a great looking sandwich. I think sandwiches are perfect for hot summer weather. Oh this is really good looking! I would love to have this for lunch tomorrow ! I should have done this with the chicken I had left over from yesterday. I ended up throwing it out because my Hubs didn't seem to want it. Next time... I am trying this recipe. That looks delicious. Seriously I didn't know there were so many things you can make with honey! Oh wow this looks so amazing! I bet it tastes as good as it sounds and looks. This recipe looks amazing and I am always looking for great sandwich ideas for our trips and outings. This is ideal for the summer! This sounds so delicious. I will have to try this tomorrow. I am sure it will be a big hit. This looks really good. I'm a fan of chicken and might make this for myself for lunch one day.